The Big Island of Hawaii is a great place to go sailing. Whether you are a seasoned sailor or just a beginner along for the ride, you are sure to love sailing Big Island. Most of the sailing charters on the island of Hawaii sail along the west coast near Kailua Kona. The west side is the leeward side of the island and offers sunny weather and calm waters which are protected from the prevailing wind and seas that come from the North East. These are ideal conditions for sailing, snorkeling, SCUBA diving, dolphin and whale watching. There are so many fun things to do while sailing along the Kona coast. Here’s some of our favorites. Dolphins always make us smile and we see plenty of them along the Kona coast. There are numerous resident pods of Hawaiian Spinner dolphins roaming the leeward coast of the Big Island. They are often close to shore in the morning when they are resting and socializing. It is in the morning when we usually see them. Often they will swim right up to the boat while we’re sailing and swim with the bow and play in our wake. In the evening they head to deep water to hunt. Once in a great while we will also see them during a sunset cruise off-shore. 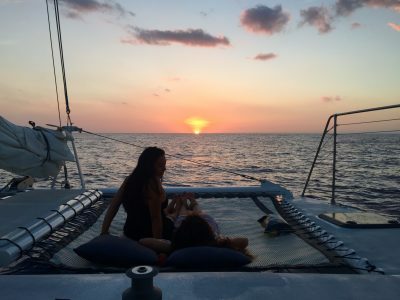 On our 36′ sailing catamaran, Kolea, we often have our guests help sail the boat. 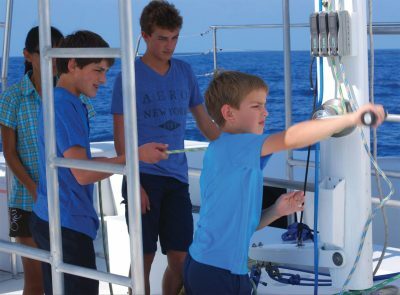 Adults and kids alike enjoy helping to raise the sails and taking the helm, and we enjoy teaching them the basics of sailing. There is just something magical about shutting off the engines and using only the wind to move the boat. The protected waters of the Big Island’s leeward side offer numerous bays to stop and snorkel. It’s hard to beat the convenience of snorkeling from a catamaran while anchored in one of these bays. You can jump right in to the warm, pristine waters without having to climb over rocks and worry about stepping on sea urchins near the shore. Back on the boat you can rinse off the salt with a warm fresh water shower, then lounge on the trampolines up on the bow. Sailing is a great way to get away from it all. Here on the big island, there are still some secluded beaches that remain undeveloped and haven’t been spoiled by hotels and houses. When time allows, it’s always a special treat to sail to one of these secluded bays, drop anchor, and just enjoy the tranquility. During the winter months, Hawaii becomes home to the North Pacific Humpback Whales. Their annual migration takes them from Alaska to Hawaii (among other places). 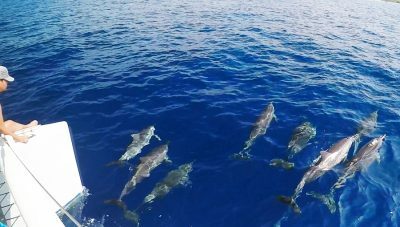 If you happen to be sailing the Big Island between December and March, there is a very good chance you will see these gentle giants of the sea. 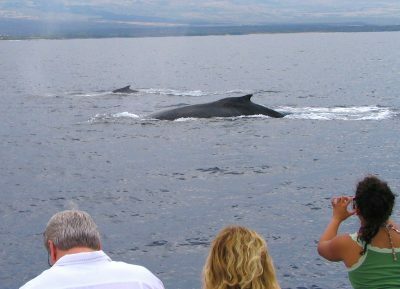 To learn more about Humpback Whales, check out LoveBigIsland.com’s very informative page about Whale Watching on the Big Island. What better way to watch the sunset than from the deck of a quiet sailboat under full sail. The sound of the ocean lapping up against the hull is so soothing. It’s a great time to just relax with a drink and soak up the conclusion to another day in paradise. Whether you take a cruise on a shared boat or book a private sailing charter, there are lots of fun things to do while sailing Big Island. 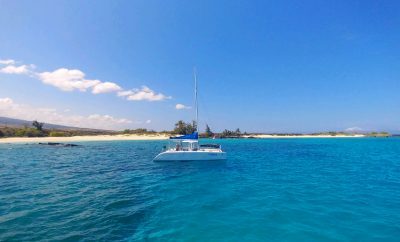 With a small, family owned and operated company like Paradise Sailing Hawaii, you will have the flexibility to do the activities that appeal to you most. It’s all waiting for you in Kailua Kona on Hawaii’s Big Island.